One of my biggest issues whenever I go to events or go out is the lack of Grab cars bringing me from one way to another. And I know for a fact that I’m not the only one experiencing this especially during peak hours. 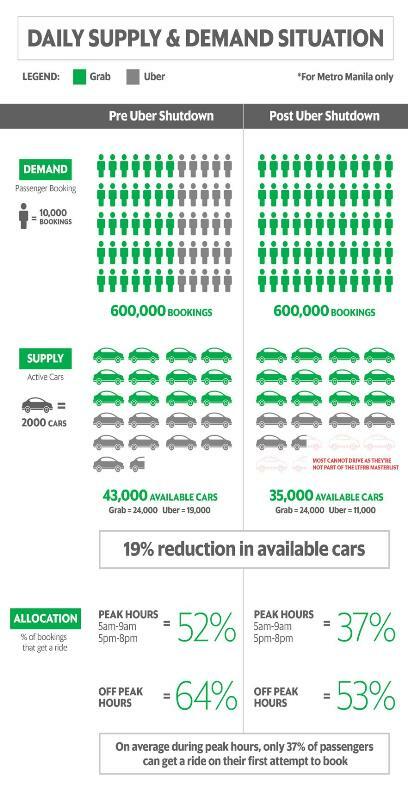 As per the infographic, even with the Uber–Grab integration, the amount of cars providing service for passengers are not able to meet the demand since there’s a number of Uber drivers didn’t transfer to Grab. This is why the ride-hailing company came up with solutions to address the issue such as the 100 –Day Driver Transformation campaign, which eyes to improve its service in the country.